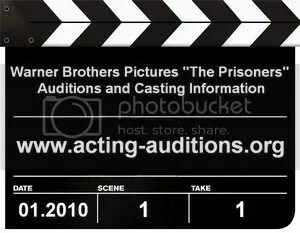 The upcoming production of the Warner Brothers Pictures feature film "The Prisoners" is now casting principal actors and extras. Filming will take place in Connecticut and Philadelphia starting in February, 2010, with a release date set for October 22, 2010. Jigsaw Casting in Toronto is holding a series of open casting calls for an OLG Television Commercial. "OLG" is a Crown Corporation of the Government of Ontario, Canada. It is responsible for the province’s lotteries, charity and Aboriginal casinos, commercial casinos, and slot machines at horse-racing tracks. Eric Erickson of Temple of The Cave Photography is conducting open calls in the Los Angeles area for all types of male and female models for projects, including paid shoots. No experience or modeling school is necessary in order to join the agency. There is no up-front agency fee upon acceptance into the agency. If you are under the age of 18, you must have parental or guardian consent before this agency will represent you. World renowned fashion photographer Nigel Barker is currently authoring his first book on beauty and is casting women to be shot for the book’s cover and inside pages. What he is looking for is naturally beautiful women from ages 18 to 26 of all shapes, sizes and ethnicities. The Hannibal Pictures film "Son of No One" starring Robert De Niro is holding an open casting call in New York City December 30th. The film’s director, Dito Montiel, is seeking boys to play 15 year old versions of Channing Tatum and Terrence Howard, and they’re also looking for girls who look like they’re 15. No experience is necessary, but only attend the open call if you can pass for 15 years old. Minors MUST bring a parent or legal guardian with them to the open casting call. The Craze Modeling and Talent Agency in Sandy, Utah is currently accepting submissions from new cients for their modeling and acting divisions. The agency was established in 1999 and is a government licensed modeling and talent agency registered and top rated by all major legal government bureaus.